Mexico’s two coasts Pacific and Caribbean are ripe for underwater exploration. You can discover the vast kelp forests of the Pacific, the hidden reefs of the Sea of Cortez and the Yucatan peninsula, and shipwrecks in the Caribbean. Pelagic-lovers will also be pleased with Mexico’s breeding grounds and sites boasting heavy currents. Not all of the dives in Mexico are out in the salty seas. During your time in the Yucatan be sure to dive in the crystal clear cenotes. The most popular, and rightly so, is the Cenote Dos Ojos. 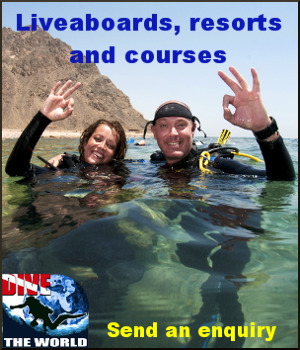 From beginners to tec divers, there are dives for every level in Mexico. The Yucatan and the east side of Baja California are generally protected from heavy current, creating good dive sites for beginners. However, offshore islands like Guadalupe and Socorro Island should only be attempted by advanced divers due to their raging currents. Furthermore, some of the cenotes require technical diving skills. Diving in Mexico mainly takes place from speedboats. It is possible to dive some of the Sea of Cortez and the Caribbean’s reefs as well as the cenotes from shore. Guadalupe and Socorro must be accessed by liveaboard vessel. While a reef hook may be helpful in some areas, they are not permitted in protected areas.